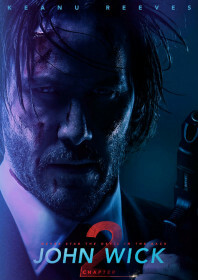 Loud, visceral, stylish sequel which picks up shortly after the events of the first film, with John Wick (Reeves, exultant) reclaiming his car from the chop shop using knives and fists and bullets. He barely has time to feed his new dog before aspiring Machiavellian tyrant Santino (Scamarcio) visits his home to issue John with a new assignment. He initially refuses, but then Santino blows his house up. The assignment takes John to Rome, where it quickly becomes apparent that his retirement plans might be somewhat delayed, as a price is put on his head and soon every assassin in town soon wants a piece of him. The sequel expands on the Wick mythology: the code of conduct between assassins – much like the Bushido principals of honour and chivalry in Samurai culture – and their mysterious currency of gold coins and markers. We see inside the secretive Continental – a sophisticated hotel chain for assassins in which fighting is forbidden, and its customers can stock up on weapons, bulletproof suits and fine wine, overseen by the benevolent dictatorship of Winston (McShane, effortless). The tone is familiarly playful and knowing, painting a world which is as grounded and familiar to its inhabitants as it is alien to the viewer. The action is rooted in gun fu and Brazilian jiu-jitsu. It is both beautiful and brutal, filmed in wonderfully long sequences of uninterrupted movement. The action feels more organic when presented in this format, and Chad Stahelski’s 87Eleven stunt team are wonderfully meticulous in their detail. You get the impression that every bullet has been accounted for. And Reeves, aged 52, is perfect casting, more than capable with the physical demands of the role and and its sense of levity. It is an absolute joy to dip back into his world.